The Courthouse - built in 1858, this Greek Revival, temple-form structure is one of the finest to be found in North Carolina or in the South. The town of Jackson can trace its origin back to the creation of Northampton County in 1741 by the Colonial Assembly of North Carolina. 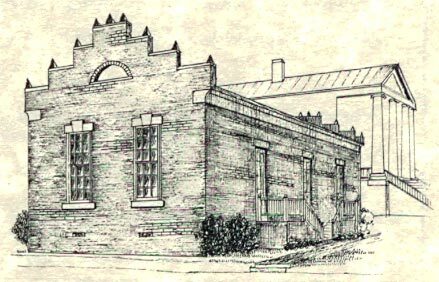 The location was determined in an attempt to find a central site for the courthouse. Soon after the courthouse was built, the site began its role as a gathering place for people from all over the county. Only over time and generations did a town develop around the courthouse square. In 1762 Jeptha Atherton purchased the courthouse lands. 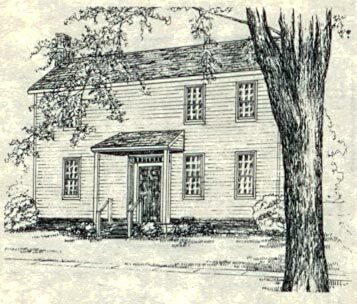 On June 4, 1798, the North Carolina Journal at Halifax reported: “For lease - - Land and Plantation at Northampton Courthouse formerly belonging to Col. Jeptha Atherton upon which is a good dwelling house - - convenient outhouses - - also a grist mill. Besides - - immediately at the courthouse there is a house which is now used as a tavern and is from its location well calculated for that purpose. And - - a storehouse near it which is well situated for a country store.” From this we have an early description of the village still called Northampton Courthouse. By 1819 a second courthouse had been erected by a local builder named William Grant. Faison House - Built c. 1790, this is one of the oldest houses left in Jackson and is the birthplace of Judge W. H. S. Burgwyn. The name Northampton Courthouse was generally used for the town until 1826 when it was renamed Jackson, in honor of General Andrew Jackson, hero of the Battle of New Orleans and later President of the United States. By this time, Jackson had become a political center with bitter debates between Whigs and Democrats, especially on election days. In 1825 the town had the honor to receive and entertain General Lafayette. The Revolutionary War hero was beginning his Southern Tour and came to town from Murfreesboro. A dinner was given for the General and he was greeted by the official state delegation from Raleigh. Famous foundation sire of American thoroughbred race horses. Buried at Mowfield Plantation just west of Jackson, NC. By the time the county seat became Jackson, horse racing and especially horse breeding had brought Northampton County national attention. 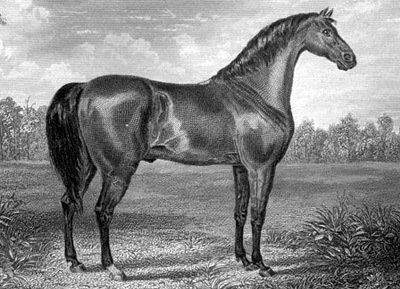 In 1816 the famous Sir Archie, “foundation sire of the American turf,” was brought to Mowfield Plantation just west of Northampton Courthouse. By 1833, the year Sir Archie died, Jackson had an active Jockey Club, which held meets south of town at Silver Hill Plantation. The year 1831 saw, completed on the southwest corner of the courthouse square, a fireproof Clerk’s and Register’s Office. Today this is the oldest surviving public building in town. It was constructed as a result of the burning of the statehouse in Raleigh that same year. Of interest also are cracks in the east and west walls as a result of the Charleston earthquake of 1886. Thomas Bragg House - Built in 1840 by Thomas Bragg, Sr. Master builder and father of Governor Thomas Bragg. Governor Bragg was a two-term governor, two-term U.S. Senator and the first Attorney General of the Confederacy. Governor Bragg lived here. 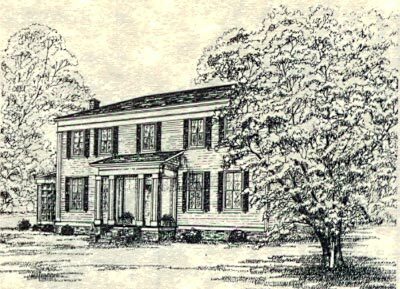 In 1841 Thomas Bragg, Jr. bought a house in Jackson that his father built in 1840. Bragg became involved in politics and the Democratic Party. He served as Governor of North Carolina from 1855-59 and later as United States Senator and Attorney General of the Confederacy. By the middle of the nineteenth century, Jackson could be called a town, and the building that still dominates the settlement and has become a symbol for the county was constructed. In 1858 the third and present courthouse was begun. Samuel Calvert served as Superintendent of Public Buildings and Henry King Burgwyn has been traditionally credited as the architect. 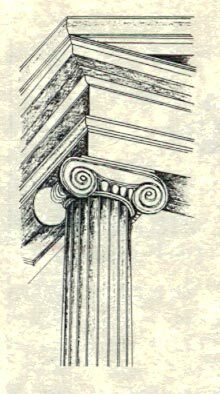 This noble structure is among the few surviving examples in our state of the full-blown Greek revival, temple form, public building. It is also without doubt one of the most beautiful. The courthouse in Jackson was almost new when the War Between the States came. In July 1863 Jackson was occupied by the Union troops of Colonel S. P. Spear. General Matt W. Ransom of Verona Plantation, located just west of Jackson, was Northampton County’s most prominent soldier. When Colonel Spear arrived in Jackson, General Ransom had his troops at Boone’s Mill between Jackson and Verona, on the road to Weldon. When Spear reached Boone’s Mill he was forced to retreat without burning the railroad bridge on the Roanoke River that had been his goal. The Clerk's and Register's Office - built in 1831, this structure is of brick laid in the Flemish Bond style with a molded brick water table. After the war Jackson, with its grassy, tree-shaded courthouse square, settled into its role as a small, very southern, county seat town. It continued its function as a local focal point for people from all over the county, especially those concerned with county business and all things related to it. It can be said that local government made Jackson. From yesterday into tomorrow, this central location sought after in 1741 still serves as a gathering place for citizens from near and far.